## Specifying the low frequency response in terms of gain is not very meaningful because of the two feedback loops, both of which have an effect on the input impedance as well as the gain and dynamic range. My preferred measurement is the point where the input impedance starts to significantly deviate from its mid-frequency value which is what I have shown above. Item 2 shows the output signal compression commencing at an input voltage of 1V pk-pk. A 2N3866 has been used in place of the 2N5109 with very similar results but the noise figure has not yet been measured. A small heatsink is required to cool the transistor. The dots show the phase of each winding. Inductors wound on toroids using the grade 43 material exhibit a small absorption notch of about 5 - 8dB at around 188KHz which almost disappears when the windings are fixed down with an adhesive. This characteristic has not been seen with other ferrite or dust iron materials or with two hole beads in type 43 material. The onset of limiting at the output with a 50ohm load rises from just over 4v pk-pk to 6v pk-pk with the use of a centre tap on the collector transformer to feed the load. This suggests that the optimum collector load is around 200ohms. IK4AUY published a pushpull amplifier using two of the above single stage circuits as shown in the block diagram to the right for which I have developed an initial PCB layout based on the values in item 1 in the above table. The measured results show a gain of 12dB and an IP3 of +40dBm when run from 12v. The input and output transformers T1 and T2 are both wound with 12 turns 30swg trifilar on FT50-43 toroids with the centre taps left floating. Based on these tests I have developed three more flexible layouts described below. Layout 1 uses two 2N5109 devices and FT37-43 troids for the collector to emitter feedback transformer cores and FT50-43 cores for the input and output transformer cores, This gives the smallest PCB size of all three layouts. Layout 2 uses MRF586 devices and FT50-43 toroids for all transformer cores to minimise IP3. Users should check the device dissipation as heat sinking these devices is more difficult. Layout 3 uses 2N5109 devices and FT50-43 toroids in all transformer cores to minimise IP3. Tests are ongoing to see if the collector load impedance can be further optimised. The PCB symbol document may be downloaded from here. I have developed a simplified version of the push pull amplifier in 3 above which the reduces number of toroid cores and also the risk of saturation in the collector core due to the collector and emitter currents. The AC Performance is similar to the circuit in 3 and the PCB area is somewhat smaller. The input impedance is 30ohms, gain = x5.6 and the output impedance is 7 ohms. A small increase in the amount of collector to emitter negative feedback will reduce the gain and increase the input impedance. Alternatively, a small reduction in the collector to base feedback will increase the input impedance and gain. For use at low frequencies some capacitor and inductor values may need to be increased. A table of values and results is shown below the circuit diagram for a single unit - the input was driven with a 50ohm signal generator and the output terminated with a 50ohm load. Input impedance measured with a return loss bridge. 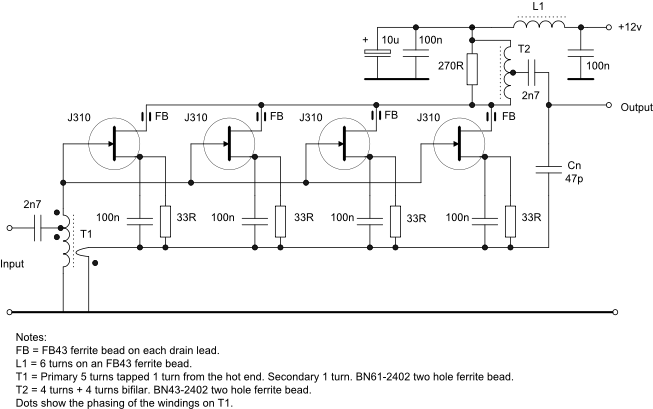 This circuit uses four J310 JFETs and negative feedback to provide a low noise high dynamic range post mixer amplifier. 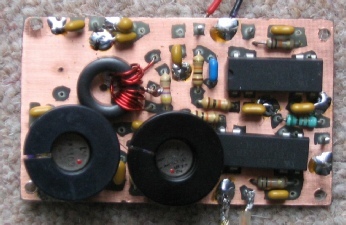 This has been designed as a standalone module using a copy of the circuit by PA3AKE in his high performance HF receiver. Measurements to date show that the overall voltage gain into an open circuit load is x8 and the current consumption is 80mA from a 12v supply - a small heatsink covering the four devices may be required. The double sided PCB was laid out leaving sufficient room for 0.5 inch diameter toroids so it could be reduced in size if the binocular cores as shown are retained. The PCB layout for the board in the photo to the right may be downloaded from here. Two alternative layouts using a more space effective long thin shape may be downloaded from here. The phasing of each of the collector to emitter windings is critical and both must provide negative feedback. The collector windings are 9 + 9 turns bifilar, spaced around the T50-43 toroid and the output winding is 9 turns wound over the collector winding. 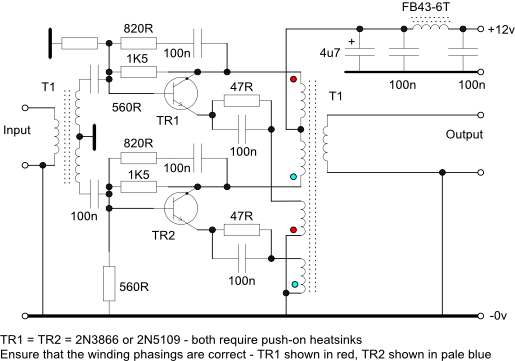 Each emitter winding is 1 turn phased as shown. A PCB layout will be provided in due course. Additional development has been carried out on the circuit in 3 above resulting in the circuit to the right. The emitter voltage has been reduced from 4v to 2v and the centre tap on L1 has been permanently installed. Both of these changes enable a higher output voltage swing to be obtained into a 50ohm load. Both devices consume around 40mA with a 10v drop hence the need for small heat sinks to prevent over-heating. The picture on the right shows the top side view with the collector transformer wound on an FT50-43 toroid. There is adequate space for a binocular core. Results below when driven from a 50R source and with the output connected to a 50R load. 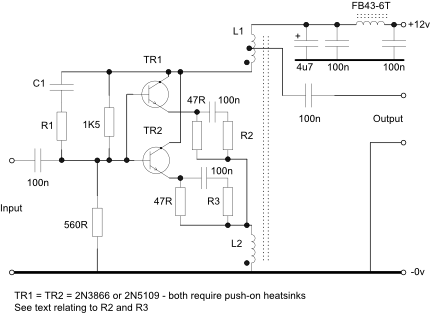 Setting R2 = R3 = 4R7 corrected a small rise in gain around 220KHz on some versions of this amplifier. A revised version of the PCB layout including the high speed changeover DIL reed relays can be seen here. 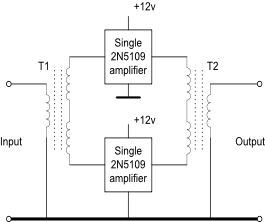 It is sometimes necessary to use a high impedance buffer/amplifier in order to tap off a signal from a particular circuit without loading that circuit and the diagram to the right will provide that function. A table of results is shown below right with varying amounts of negative feedback. 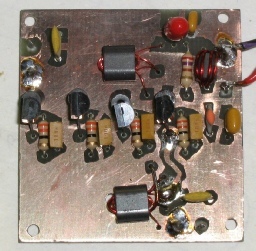 Results were measured at 5MHz and the low frequency response extends to well below 1MHz although this could be extended by increasing the number of turns of L2 and L3 and the value of the source decoupling capacitor. The output power level is determined by the active device and its drain current and could be increased by using multiple devices in parallel with individual current balancing source resistors. The maximum output voltage into an open circuit from output 2 is 15v pk-pk with clipping just becoming visible on the negative peak. As with any inductive feedback amplifier the frequency response may be determined by the -3dB amplitude points or where the dynamic range is reduced by 3dB. In high performance equipment the latter is generally more important. 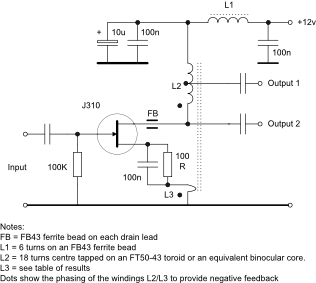 Note the reduction in the output impedance as the amount of negative feedback is increased. 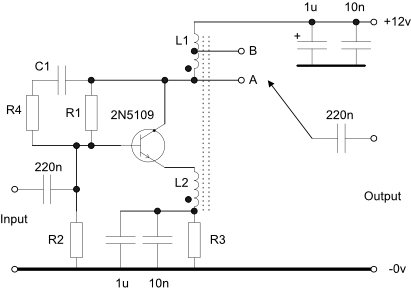 This circuit could be used to isolate cascaded filters.